Food and Wellness Group > The Food Well > 5? 7? 10? It’s Still 5. 5 CUPS, That Is. A clear, meaningful and easy-to-remember goal has new meaning in an effort to increase consumption of fruits and vegetables for better health. The recent international publicity for the University College London study, which found that those who eat at least 7 “portions” and as many as 10 portions of fruits and veggies a day achieve dramatic increases in longevity, has led to increased discussion—here and in Europe and beyond—about promoting more ambitious daily targets. Some have raised questions about the prospects of introducing new messages and targets such as 7-a-day or 10-a-day. In England, it’s been argued that they should stick with “5” since so few people seem to be reaching that number. Canada’s Food Guide says “7 to 10 servings.” Australia has created “Go for 2 and 5,” while New Zealand has created its “5+ a day” theme to encourage extra servings. In the U.S., the two most prominent messages about fruits and vegetables use thematic communications with no specific quantity goal: “fill half your plate” and “more matters.” But, if you look deeply into the rigorously reviewed and periodically updated Dietary Guidelines for Americans, you find the best guidance we’ve got—the actual, recommended amounts we should be eating ever day. 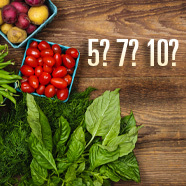 For those people who consume in the range of 2,000 to 2,600 calories a day, the good old number 5 still has a great deal of meaning. However: that’s now 5 CUPS, not servings or portions. This means, on average, about 2 cups of fruit and 3 cups of veggies every day. The DGA recommendations provide the clear 5 cups a day goal for most Americans. At The Colors of Health®, we believe in the potential marketing and motivational power of the 5 cups a day goal. There still exists significant awareness of, and equity in, the number 5 for fruits and veggies. With the 2005 and 2010 updates to the DGAs, the number 5 is even more relevant today than ever. As reported in a recent article in The Packer, we also believe that “color” is the best way to leverage and trigger the broadly recognized health and nutrition benefits of eating a wide variety of fruits and vegetables. Colors mean health and variety. (“Colors of Health® Seeks Retail Impact”, April 2, 2014). Color, and a clear 5 cups a day goal, are the key elements of the simple marketing message strategy to increase consumption. 5 Colors. 5 Cups. Every Day. We believe this can be the pathway to both better health for Americans and to a potential doubling or tripling of sales of fruits and vegetables in all forms, over the years ahead.